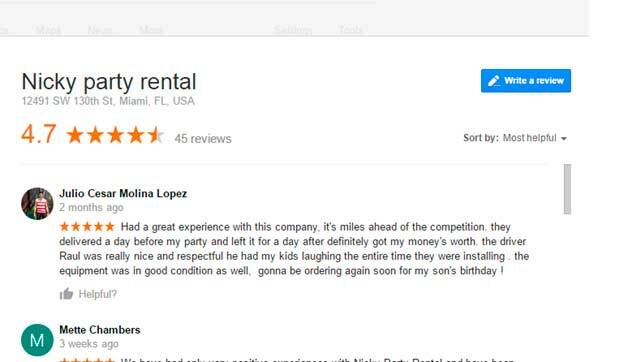 How good are the reviews for our Bounce house rental Miami services? Today we will go over our ratings and how we stack up against other party rentals in Miami. So let’s go over Google reviews first. We have 45 clients leaving reviews on google we try our best to offer the best service for them. If there was a problem we always try to solve it. We have 15 reviews with a total of 4.9 star rating. We love our Facebook fans and clients there, we always try to answer any Facebook questions as fast as possible. We have over 1720 likes from our customers and friends and we thank you all. On our yellow pages reviews we have a 4.5 star rating out of 21 reviews. Most companies won’t take the time or can’t really qualify for the standards of the BBB. We make sure we are in good standing with the BBB. 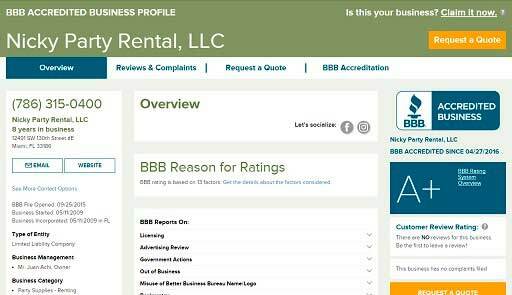 Businesses must meet, commit to and maintain the BBB Code of Business Practices to be eligible for the Better Business Bureau. As you can see for yourself we try really hard to satisfy everyone. Our goal at Nicky’s is to be your main party company. We try to be on time because we know you guys need to do other stuff for your event. Our equipment goes thru a checkup before it is sent out to an event that includes bouncers, tents, and every other item. We will always give you a friendly and professional service. We also want to thank every client that we have service before. Without you guys we wouldn’t be one of the top companies in Miami. There are thousands of party rentals in south Florida but not many last because of bad service. You can go into yelp and other platforms and see low star reviews for many business. 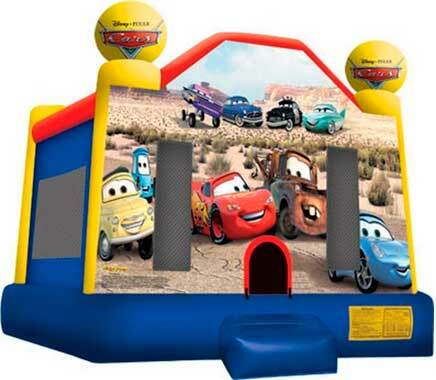 Start off with a boom with a bounce house party or with a wonderful event in summer. With the sun, sunny you can exploit nature and utilize many parks or banquet halls. Under the sun, get ready for an event that presents everything that we love about the seasons in this time of year. How huge do the client want their event and how can we help them fulfill their potentials are up to us and our staff. Also, we can get you the expertise on what you are going to need and plan ahead. First, you are almost at the arranging stages for your occasion… how might anyone be able to perhaps get the date incorrect? Merchants regularly have different business coming in and all it takes a mistake. Customers may consent to a date and time for the occasion and after that basically neglect to inform you of the adjustment in arrangements. Before you start arranging your occasion, check the date, time, and get these in text so everybody is in agreement. In any case, some might get bothered but perfection is a must. Taking a walk through the event site with your customer and sellers is a basic tip in the occasion arranging process. It shows a chance to address warnings, talk about issues, and check the over-all movement of the occasion. In many cases, although when we think we are conveying unmistakably, our vision of something different to what another person is imagining in light of our portrayal. Go out for a stroll through of the physical space amid the arranging stages so there are no curve balls on occasion day. Basically, an event to a bounce house party our different for the most part. First, instructing once should be enough and then no worries right? Hiring extra help is a critical that is every now and again ignored by unintentionally not noticing everything or anything. Life has a way of changing even with our best judgments is on target and chaos might arise. In hindsight, with so many possibilities and you might forget something. Hiring extra staff is very important if the event seems too big and magnificent. Furthermore, there are so many things on your mind that you might overlook because you’re too occupied with other administrative things. 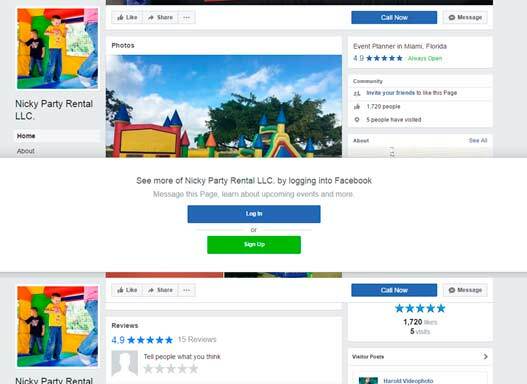 Priding ourselves on reliability and carrying many items like bounce house, waterslides, chairs or tables is our main goal at Nicky Party Rental. We understand the significance of your occasion and are resolved to provide you with a level of unwavering quality. With the best operations team in the business, you can be guaranteed that each conveyance will be done in an auspicious way with the best regard given to you and your property. Bounce House Miami | What would be the Perfect Gift? The perfect gift is not in a birthday box it’s at a bounce house rental Miami! Also, if you are experiencing serious difficulties of an innovative, fun, and energizing birthday show for your next gathering? Need to ensure your blessing isn't quite recently one of a kind, however noteworthy? Being a parent of a birthday kid shouldn’t be nerve racking. Go ahead be a Superman! At that point consider giving something more than a toy. It's precisely the sort of marvelous, consideration getting a bounce house castle. I’m going to paint you the perfect picture. The birthday boy or girl tearing presents, without end at wrapping paper to uncover toys, different stuff, and garments’. Some of which might be the same and even seems boring. Suddenly, when it comes time for your present, no toy box. Confounded, the gatherers and the prince or princess look sad. Rather than delivering yet another whacked present, you lead the whole party outside. When they stroll through the entryway, they find a gigantic, brilliant bounce house in which they can play for the following a few hours. Now, you become Superman! Your endowment of a bounce castle isn't restricted to birthdays. It can be the raving success of the gathering for different occasions also, including functions, school, church, and other big events. In any case that your endowment of a bounce house rental Miami is memorable and talk about for a long time. At the point when the various presents have been secured, spent, or exhausted, the gathering visitors will have the recollections of the fun and pleasure they had playing in the fun house. 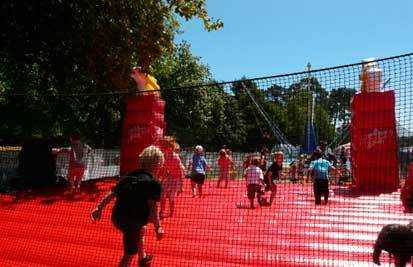 Inflatable obstacle courses are a great fun and awesome to fulfill your kid's natural energy. Children can race each other or simply run wild through all the pop-ups, side bars, burrows, shake dividers and slides. There are such a large number of various approaches to have a great time. There are likewise inflatable courses that take into consideration members to have races and go up against each other. These are normally rectangular however, most obstacle courses have two paths, and some can have three or four. They highlight different, for example, fly up obstructions, climbing territories, slides, and passages. It’s great to have different options to lease a bounce house rental Miami. So on the off chance that you are searching for a blessing that individuals will recall for quite a long time. Basically, then consider giving the super gift of a fun, beautiful, and awesome inflatable castle. 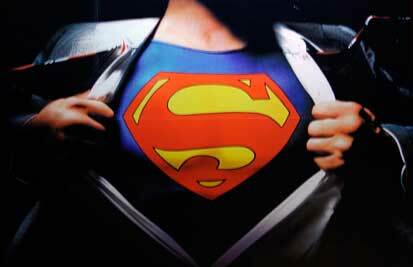 In any event, is a priceless memory to remember for some time and for brief moment you can be Superman! Let’s go over 5 most haves for a birthday party or event that you can get at an party rentals Miami. Regardless of whether you're arranging a wedding gathering, birthday party, family fun time, or an event to impress. Utilize this rundown of our most famous open air party rental things to help you remain on track. That way, you won't let any vital things become lost despite a general sense of vigilance. Sometimes parties can get boring and even lame. Everyone is taking care of their kid and it becomes really tense. What about leasing or buying a bouncing house rental Miami or maybe a water bounce house rental Miami to entertain the guests. We provide you and your loved ones with a one of a kind experience. Additionally, with our growing rapidly and expanding selection of bounce houses and water slides .We can get you an amazing experience and fun. Being unique means not doing the same party every single time it means special. Firstly, being prepared is a necessity when it comes to setting up a party or event. With that in mind, I mean weather or just plain good old sun. 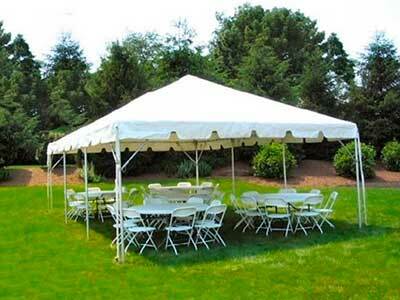 We offer extraordinary options for your wedding or gathering tent rentals. For the most part, if you are trying to settle for a big tent or small tent, we have excellent tents. Although, in some cases, the area you put the tent will require a pole tent rather than a frame tent, please call us to help you. It’s very important to tie down the tents and as safety is first. Lastly, good set of chairs and tables to allow the guest to be seated and munch on your great food. Visitors for your occasions will dependably require some place to relax and dine. Why trouble with the bother of tables and seats when you can simply call us and let us do the truly difficult work. Visitors will value the effort to make everyone comfortable and relax. No matter how big or small the party we carry many items and for any budget. Nevertheless, we also carry many other items like food machines, general party items, dance floors, and many more. Our straightforward goal is to give you magnificence and motivation. Above all, your occasion is personal or amazing, we are excited for being a piece of your vision. The best parties are made because of you and your good planning. 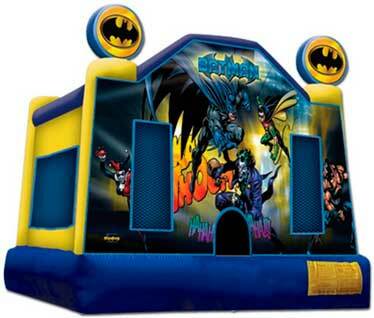 A bounce house rental Miami is perfect if you are experiencing serious difficulties of an ideal birthday gathering. Need to ensure your event is one of a kind? Want to be the legend of your next birthday party? At that point consider giving the endowment of a bob house rental. It's precisely the sort of fantastic gift you're searching for at a reasonable cost. Your endowment of a bouncy house isn't constrained to birthdays. It can be the raving success of the gathering for different occasions. 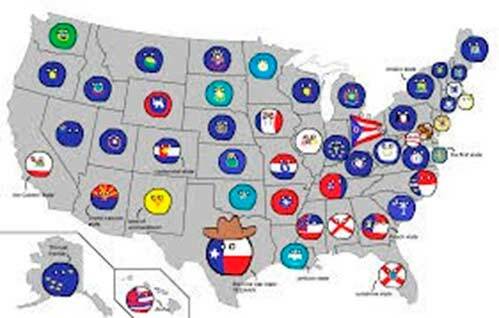 Namely, including Jewish rites of passage, first fellowships, graduations, church picnics, and other events. One thing is sure, be that as it may your endowment of a ricochet house rental is certain to be the blessing that individuals will recall. At the point, when the various presents have been secured or exhausted. Certainly, the gathering visitors will have the recollections of the fun and pleasure they had playing in the bounce house. One of the simplest, quickest, and best approaches to make that extraordinary birthday party. For one thing, your kids will never forget is to include a ricochet house rental from Nicky Party Rental. Envision the expression on your youngster's face when they stroll into your terrace or wherever you have. Then see a huge, brilliant inflatable castle stronghold or other inflatable fascination that is all theirs. Admittedly, it’s difficult to put a cost on that sort of minute. Inestimable occasions like this come just a couple times amid your kids’ young life. So exploiting it when you can is basic. Your youngsters anticipate that you will over hyped their birthdays. Weeks before the enormous day arrives, you are caught up with arranging their gathering and assembling the list of attendees. However, envision the amazement on the characteristics of your youngsters when they return home to find that you have assembled an unexpected gathering when it isn't even their birthday. Leasing another inflatable when it isn't your kid's birthday isn't recently unforeseen, it's likewise delightful! They will shout with pleasure when they get back home on what they believed would have been simply one more inauspicious summer evening. So then, to find that you have a wide range of fun arranged out for them and their companions! Note: While tossing a birthday bash or at a substantial event, grown-ups ought to never take their eyes of their tyke. Be that as it may, it generally helps when guardians keep watch while their children play. In any case, remember, when specialists are available, please make an effort to remain aware of them and the standards. At the point when the bob house is at a private gathering, a parent ought to dependably keep watch. It’s a moonwalk different than a bounce house? Here at Nicky’s we sometimes get calls from customers wanting to know what a moonwalk is. Are they the same as bouncers or totally different? Today we will go into detail about this subject. The term “moonwalk” literally means walking on the moon. Well, the term actually describes the feeling that we get when we walk and jump on an inflatable. So basically moonwalks are the same bounce houses, but why the different names? Let’s start with a little history so we can get the whole story. The first moonwalk was designed and created by John Scurlock, he was an engineer with a Master's Degree from the University of Texas A&M. After a stint in Germany in the army he came back to work at a local college as the Director of the physics department. Now let’s get to the good part, Scurlock worked with NASA prototyping many inventions. From this invention, he created an amusement ride called “spacewalk” which is another term used to describe inflatables. As with a lot of inventions, this wasn’t the main objective, he was trying to create an inflatable cover for tennis courts that could be stored easily and used quickly and easily at the first drop of rain. One day he noticed that his workers could not resist jumping with joy on this device. The idea came to sell the spacewalk for entertainment but the market was really small. So his smart wife came with the idea of renting moonwalks’, thus the first inflatable rentals company came about. 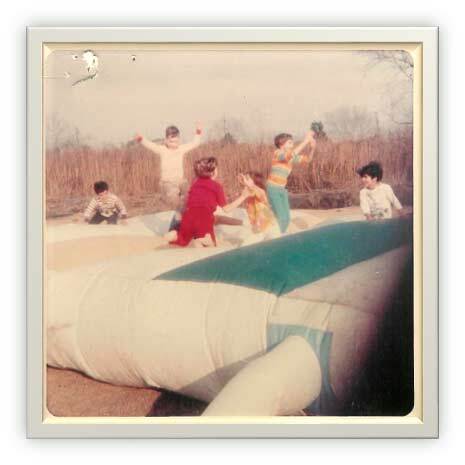 The first inflatable bouncer, which is another name for this party equipment was basically an inflatable mattress. It didn’t have walls or a roof but it was fun as heck to use. In our beloved South Florida, we usually rent them as bounce houses. In Spanish, we called them "Brinca Brinca". So no matter the name just pick the one your kids likes and let's get the party going! These inflatables are a must for any kid’s party nowadays this has become the most rented item for party rental companies in Miami FL and U.S. So don't have a kid's party without this inflatable to jump on.